It's almost weekend and weekends in South Africa in the summertime invariably involves at least one braai. Or bbq for the non-South Africans amongst you. There will be the usual suspects, of course - chip 'n dip (packet of chips/crisps and some form of dip), braaibroodjies, potato salad, skaaptjops*, boerewors**, many a six pack (of beer, what else?) and good old vanilla ice cream with chocolate sauce for dessert. The rest is negotiable. Perhaps some grilled mielies***, potently garlic-y bread, pap en smoor*** or even a curried noodle salad. Those curried noodle salads are immensely popular over here, heavens knows why. These skewers push the envelope a tad, but still manages to be fairly low-fuss. After quickly pre-cooking your potatoes and aubergines, you're left to chop them into chunks (no need for perfect cubes here) and then the assembly takes mere minutes. 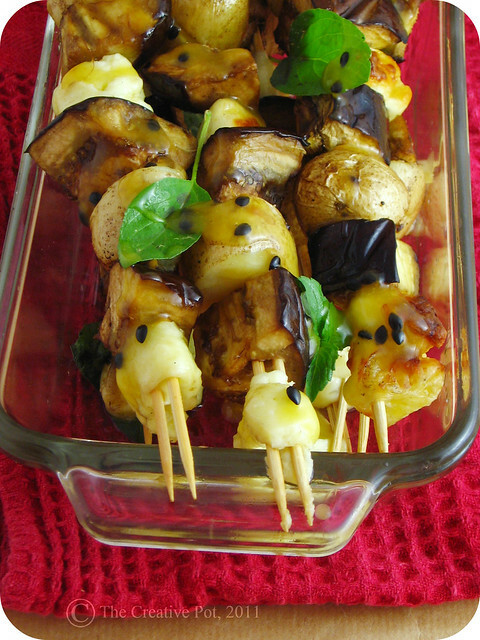 A chunk of cheese, half a baby potato and cube of aubergine on a skewer; rinse and repeat. Brush with oil and toss onto the fire, where the smoky goodness infuses the vegetables and gives the cheese it's golden, crunchy exterior. Paired with a quick-to-whip-up grenadilla dressing (work with me here), the final result is perfect weekend food. **South Africa's national sausage, literally translated as "farmer's sausage". **** stiff porridge made of maize meal, served with a simple stew of tomatoes & onions, very popular amongst the residents of the northen parts of the country. This can't really be called a recipe, as it's so straightforward to make, but the combination is a good one, and so I've decided to share it. The grenadilla dressing might sound strange, but it works charmingly, imparting a sweet & sour taste that beautifully accentuates both the salty, crunchy cheese and the smoky aubergine, while the potatoes gives some substance to the affair. Think of it as a twist on a citrus-y dressing and you'll be smiling in no time. 1. Pop potatoes (skin on) in the microwave for a few minutes until soft and cooked through. Allow to cool, then cut into chunks. 2. Steam (or fry, if calories aren't a concern) aubergine chunks until just starting to soften, but not yet fully cooked. Allow to cool, then cut both aubergines and potatoes into chunks. 2. 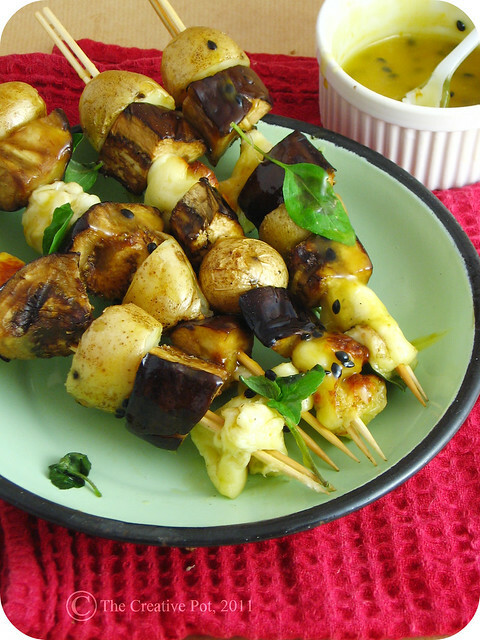 Thread potato and aubergine chunks onto skewers, interspersed with cubes of halloumi and a few basil leaves. Brush with olive oil before placing on the grill and cook for a few minutes on each side, or until aubergine is cooked through and halloumi is golden. 3. Meanwhile make your dressing by combining all the ingredients in a small bowl. Spoon over skewers as soon as they come off the fire, then serve. Even in the winter my mom still forces my dad to head out in the cool and heat up the bbq. I used to get irritated having to eat a burger in the middle of winter...but now I would kill for one of these skewers! Halloumi and eggplant, a great combo! Great idea for a veggie combination! I'm always looking out for interesting vegetarian options for the braai and I can already imagine these would go down well even with the carnivores! Oh my heavens that looks divine... Marisa your food is so consistently good. YUM! You did push the flavor boundaries here, I am impressed!! awesome recipe...with great combo of ingredients...! Loved it ! I love food that pushes the envelope. These skewers look incredible. This is simply stunning and such a great recipe for a veggie bbq. Although, I'll have to wait a few months for summer to pop by the UK. Lovely blog- thanks for stopping by mine!